Many cattle producers have long known how reliable the Angus cattle breed is to bring in high profits for a farm or ranch. However, this reliability means little if you are unaware of how to go about Angus cattle rearing in the proper way. You can ruin a herd with poor care and clumsy handling. We provide you some important information that you need to know prior to starting to raise Angus. 1. Determine which feeding method that you prefer since there are both open-foraging and grain-feeding or feedlot methods practiced today. This is important to decide before bringing animals on your land since you will need to prepare ahead of time for either method. 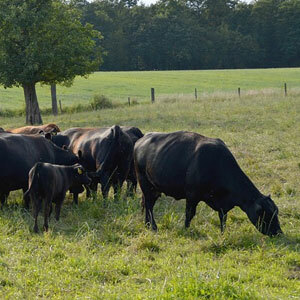 After all, the foraging method requires lush pasturelands that are ideal for all seasons including winter and the feedlot methods require stocking up on grain and other ingredients to supplement the diets of the Angus. 2. Decide how large of a herd you can handle effectively. Since all cattle farms or ranches vary in size, only you can determine how many cattle you should have on your land. Also, the number of helpers you can afford to help you may be another determining factor here. 3. Ensure that you have shelters or sufficient tree coverage to protect the cattle during inclement weather. There are times when the cattle will need to be out of the hot sun, pouring rain, high winds or other weather happenings. 4. Buy the best seed stock even if you need to start off with a smaller herd than you eventually plan on owning. Question the supplier of this stock to learn about the heritage of each cow and bull that you have an interest in purchasing for your herd. By doing so, you will provide yourself a head start with raising a healthy, productive herd. 5. Provide daily care to your herd to ensure that they are eating correctly and that they have sufficient water to drink. If you notice that any cattle are not gaining weight as they should, you should supplement their diets to improve upon their weight gain. 6. Collaborate with a veterinarian to ensure that your Angus cattle have the best possible care throughout the year. Learn the signs of any health issues so you can spot when your cattle need special or medical attention to solve their issues before they become serious. For further details about what you need to know about Angus cattle rearing, rely on Southfork Angus. We have been supplying the Mornington Peninsula with quality, Angus seed stock for years. Southfork guarantees that all cattle from us are reliable producers, mild natured and easy to handle.